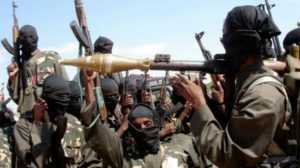 WASHINGTON — A Nigerian governor said that the Islamist militant group Boko Haram is better motivated and has better weapons than the Nigerian military. Reuters reported that Kashim Shettima, of the Nigerian state of Borno, was upset by the military’s lack of initiative. The military denied that the rebels had better arms than them. The Nigerian government asked for help from neighboring Niger to fight the Boko Haram militants, as a part of their security pact. Shettima is the governor of the hardest-hit state in the country, regarding deadly Islamist attacks on civilians. Last Friday, a Boko Haram raid on a Nigerian village killed over 100 people. Nigerian President Goodluck Jonathan ordered extra troops into the Borno state to end the Boko Haram insurgency, whose militants are trying to carve out an Islamic state in the majority Muslim north. The village that was attacked was Izge, close to the border with Cameroon. Boko Haram militants shot at homes, blew up explosives and burned down homes during their deadly raid. Boko Haram had raided another town before, killing students as they slept.